Baptised: 9th July 1876, Briningham, Norfolk – parents: Henry & Emma Barwick. Died: 16th August 1917; age 41; KiA. Residence: 43, Belle Vue Road, Ipswich. Employed: as a Collector for Prudential Assurance Company for 9 years. Enlistment Location: Bury St. Edmunds, Suffolk – into the 4th Norfolks in October 1916. Later transferred to the Royal Irish Rifles with whom he went to France in January. Wounded in the face and shoulder on Good Friday – was in hospital for a week before returning to his regiment. Rank: Rifleman; Service Number: 41396. Regiment: Royal Irish Rifles, 9th Battalion. Panel 138 to 140 & 162 to 162A & 163A. 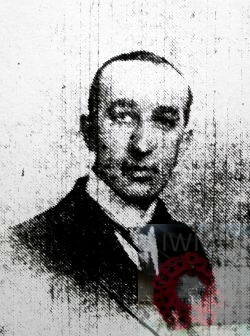 Relatives Notified & Address: Son of Henry & Emma Barwick; husband of Ethel Barwick, of 6, Arthington Flats, Valley Road, Sheffield. 1881 ‘White Horse Inn’, Briningham, Norfolk. Albert was 4 years old and living with his parents & siblings & step sister. Henry Barwick, 42, an Innkeeper & Grocer & Baker, born Briningham. Emma White, 42, born Weymouth, Dorset. Jeanette Emmaline White, 15, born Lambeth, Surrey. Wallace James Barwick, 12, born Briningham. Blanche Charlotte Barwick, 11, born Briningham. Augustus James Barwick, 9, born Briningham. Winifred Barwick, 6, born Briningham. Mildred Barwick, 3, born Briningham. James Barwick, 1, born Briningham. 1891 78, Dial Yard, Barrack Street, Norwich. Albert was 14 years old, a Boot Manufacturers Clerk. He was living with his parents & siblings. Blanche, 21, a Baker’s Assistant. Winifred, 16, a Baker’s Assistant. 1901 41, Vincent Road, Ecclesall Bierlow, Yorkshire West Riding. Albert was 24 years old, a General Clerk. He was boarding at the home of his employer, 64 year old, George Howlett, a Commission Agent – own account. 1911 43, Belle Vue Road, Ipswich. Albert was 34 years old, an Insurance Agent – Prudential. He was married & Head of the Household. Image courtesy of Sue Holifield . Albert had a good voice, and was a choirmaster of a church in Sheffield. When he moved to Ipswich he joined the St. Mary-le-Tower choir. 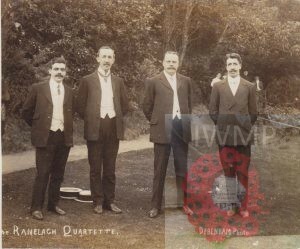 He was a member of the Ranelagh Quartette. Frank Reginald Barwick, born July 1906, Ipswich.